The statistics and stories of traffic fatalities in China are pretty scary. One website claims 625 people are killed every day. But no one really knows because the reporting is unreliable. The government is enacting rules to help control traffic and decrease the number of accidents. There is pressure on police to show that these policies are working so they don’t report everything. There is no benefit in embarrassing the higher up! In the fall, I read with sadness of the two-year-old girl who was left in the road after being hit by a van while people just walked by until she was hit by another car. Passersby were afraid to help her. They were worried they would be blamed, fined and or imprisoned. The world reacted with shock and condemnation. But living here, you could understand how it could happen. There is no protection for the Good Samaritan. Most accidents are settled privately, with one party handing over cash to the other. No one wants the authorities involved. Even if it is not your fault, you could end up in trouble. Things are arbitrary enough and who you know still matters. It seems so different than the world I grew up in, but must say, I have never given it all that much thought. My friend Suzanne and I had loaded the dogs into the car and were heading out into the country for our weekly big walk. We were about a kilometer from my house, along a very busy road, when we saw a man with a moped lying near the edge. Was he fixing his bike? It was hard to tell until we got up close. Then it was all too obvious. He was badly hurt. We jumped out of the car and ran back to him. He was laying face down, his moped on top of him and blood oozing from his head. He was perfectly still. Another man on a moped also stopped and was trying to call emergency services. We discussed turning him over, but Suzanne said we couldn’t. We would get in trouble. The man on the moped agreed. He seemed terrified to be there at all. Another Chinese man, who spoke perfect English, stopped to help as well. He assumed we’d hit the man and took charge. 40 minutes later the ambulance arrived. By then we all knew he was dead. They rolled him over. His face was unrecognizable, nothing but pulp. He was a well-dressed man on his way to work, his bag across his chest. There was nothing extraordinary about today, clear, cool and not too much pollution. 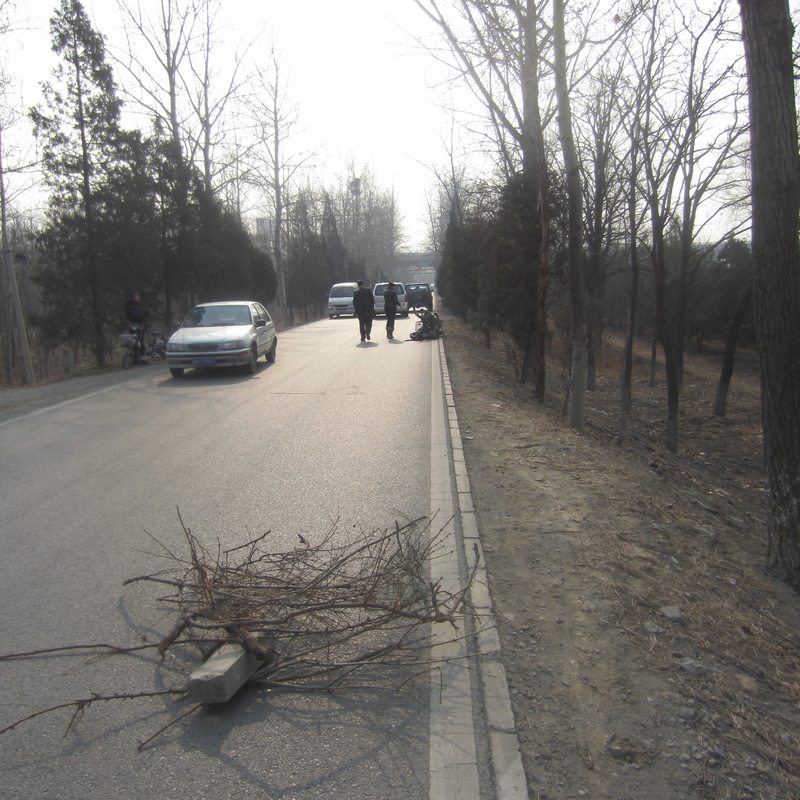 We put tree branches on the road in front of the man to slow down speeding cars so they would not hit him. More than 250 cars drove by us as we waited for help. A few slowed down, a few were annoyed at our roadblock, none stopped or asked what happened. Once the ambulance arrived they told us to go. No one asked what we’d seen or what we knew or who we were. The police might come later. It was so sad, so lonely, so odd, just leaving. Life is strange. I couldn’t stop shaking. I’m still numb and cold. I desperately wanted to run to school and hug the boys. And I’m trying to appreciate every minute, because you never know. I hope you might track down the “rest of the story” for us. I saw the video of the child that was run over. This must have been nearly as bad to witness this personally.